Allison Burney | Adventure Awaits! I'm a coffee-addicted writer with a passion for travel, lifelong learning & personal growth. I view life as an adventure and document my journey through it right here. I hope to inspire, encourage, and motivate you to live a more fulfilling life through my personal reflections on anything and everything I encounter along the way! Last night, I was riding the subway and listening to music, something that’s become a daily routine of mine while living in Busan. Traveling to and from my many different teaching jobs, I easily spend a few hours on the subway each week. A familiar song started playing, and my immediate reaction was to skip it. But as I pushed the “skip” button on my screen, a thought appeared. Why do I always skip this song? It had come on dozens of times before, but every single time it had started playing in the past, I had skipped it then, too. This intrigued me. Is it because I don’t like it? Or is it just because that’s what I’m used to doing? As I wondered about this for a moment, though, I realized something even more interesting. I was pretty sure that I’d never, even once, listened to the entire song before. My curiosity compelled me to return to it. I figured there must be a reason I’d written it off all this time, and I wanted to find out what it was. I closed my eyes and settled into the warm collar of my puffy winter jacket. I had a long ride ahead of me, and now was the perfect time to rest my tired eyes. The song, “Everything Has Changed,” began to play again, and this time, I was all ears. Blocking out the occasional screech of the subway as it ran along its tracks, and pretending there weren’t hundreds of other people sitting and standing all around me, I gave the music my full attention. After a few bars of what turned out to be beautiful music, Taylor Swift’s unmistakable voice started singing, low and sweet. Moments later, Ed Sheeran chimed in, and the two began a beautiful duet. Eyes closed, I let the rhythm flow through me. By the time the chorus rolled around, I was tapping my foot to the beat, mesmerized by the lyrics. What had I been thinking? All those months, I’d skipped the song without a second thought. Now, I couldn’t get enough of it. I put the song on repeat, liking it more and more each time I listened. I soon loved everything about it – the music, the lyrics, the rhythm, the way the voices of these two people came together to create something beautiful. I guess I hadn’t actually been thinking at all. I had just been doing. I’d been clicking that “fast-forward” button with absolutely no thought involved. I had obviously misjudged it all those times before, but I now recognized my mistake. Unlike so many songs these days, this song had meaning. It was about something real. And yet, I hadn’t even given it a chance. The only one missing out here was me (Taylor Swift probably wouldn’t care whether I ever listened to the song or not). Realizing this made me wonder how many other things I’ve been “skipping” over lately. If I could simply overlook a great song, there was no question that I could also be overlooking much more meaningful things on a daily basis – things like people, relationships, and passions. So, how do we avoid doing exactly what I did – judging something unfairly, and, in the process, passing up the opportunity to discover something wonderful? We do our best to be open to new experiences as we go about our lives. The tendency to stick with what we know will always be there. So will the tendency to judge – whether it’s people, places, things, or situations we’re judging. But when we notice these tendencies, and take the time to question them, we can learn something from them. My lesson from this situation? Sometimes, curiosity pays off. When we act on our questions, we may be rewarded with rare, beautiful moments. Curiosity didn’t kill the cat – it saved him from a life of boredom and missed opportunities. The moment I wrote that 501st word on the final day of my first-ever writing challenge, a wave of excitement flushed through me. By the time I had finished my post and published it, I was on cloud nine. Had I really done it? Was it really possible that I had written 15,000+ words over the past month? I didn’t know how I’d done it, but I was amazed. As the numbers sunk in, I thought Wow. This is something I can really be proud of. Just a month earlier, I had repeatedly sat in my apartment, wondering why I had wasted so much time not writing. I had done everything but write. I had been living in Korea (for the second time) for over nine months at that point, and had barely written anything at all in that time – and not for lack of subject matter. There were a ton of things I could have written about – my travels, day trips around Korea, my job teaching English, or what my daily life in Busan is like as an expat, to name a few. But I didn’t. I just let day after day slip away, without a trace. No words or stories to remember them by. No evidence that they even occurred. There I was, in a great position to write some original and unique content, wasting this incredible opportunity I had. The voice in the back of my head (everyone has one, right!?) certainly didn’t approve. As each day passed, I could hear it growing more and more agitated with my general lack of motivation and productivity. You’re not always going to be living abroad, with unlimited experiences to write about, it would tell me. Stop wasting this adventure and get cracking! Thankfully, my routine of avoiding that voice eventually stopped – with the start of the writing challenge. But somehow, a week has already passed since I successfully completed it. So now, it’s truth time. Have I written since then? 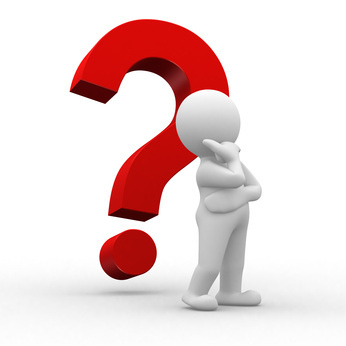 The answer I’m tempted to give: hardly, but…it’s because ___________ (insert every excuse I can think of here). Sure, being busy or tired or lazy are all reasons why I couldn’t write every day this week, but are they good ones? So far, I’ve only written two days this week, and I can tell you that after writing for 31 days straight, it feels weird. It feels like I’m shirking a responsibility; like I’m getting away with something I shouldn’t be. This week hasn’t been completely useless, though – it’s taught me a little about habits. In order for something to truly become a habit, there has to be doing involved. There needs to be some sort of action. Simply thinking about doing something doesn’t cut it. Since finishing the writing challenge, I still think about writing every day. When I wake up every morning, the intention to write is always there, but the follow-through, sometimes, is not. And that’s the most important part. People say all it takes to build a habit is to do something repeatedly for a certain number of days. Sounds pretty reasonable, right? Maybe even easy. But I think there’s a lot more to it than that. Habits are not just going to sustain themselves, because you dedicated X number of days to them initially. They’re not going to reward you for your good behaviour – unless you put the work in to deserve the reward. Just because I built up a writing habit during the last month doesn’t mean that the work is going to do itself from now on. Without effort and dedication, habits can disappear just as quickly as they appeared in the first place. 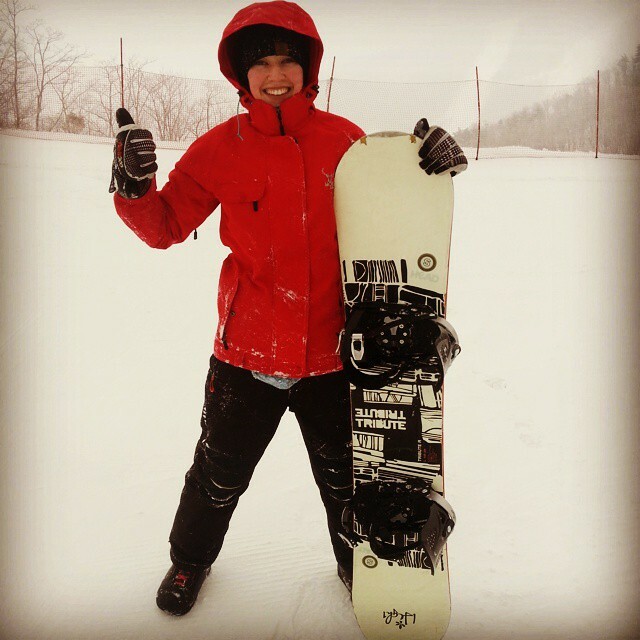 On Sunday, I tried snowboarding for the first time ever. I’ve been skiing many times in the past, but for some reason, was always afraid to make the switch over to snowboarding. Leading up to my school field trip each year, I’d wonder the same thing: should I try something different this year? But when the trip day finally rolled around, I’d find myself thinking that I better stick to what I know. It’s safer that way. Trying to learn how to snowboard on a school trip didn’t seem like a good idea. What if I got hurt? Now, a few years down the road, I’m learning more about what it means to “play it safe.” Here’s what I’ve come up with so far. To me, playing it safe means routine. It means being comfortable. It means familiarity. It means safety. And these are bad things? you ask. Of course not! Routine can be nice. Being comfortable usually feels good. When you’re familiar with your surroundings, you feel confident that you can successfully navigate your way through your daily life with (hopefully) few problems. You likely also feel safe, because you know how things work (or how they’re supposed to work), and you can adapt accordingly. But routine and familiarity also leave little room for growth, as they rarely challenge you. Depending on how you look at it, these things can either be your best friend, or your worst enemy. As I experience and learn more, I’m starting to view them more as enemies. The reason for this is simple: they stop me from growing. They hold me back from all the rich and unique experiences that are out there waiting for me. Gaining new experiences isn’t always easy. Sometimes, it takes a lot of effort, time, and energy. My journey to the ski resort, for example, was an adventure of its own, and not an easy one! I had to wake up at 1:30 in the morning, take a taxi to a bus, take that bus to another bus, and then ride overnight in order to get to the resort bright and early. We arrived around 7:30 a.m., and set out for a full day on the slopes, shivering and running on very little sleep! It was certainly a challenging day. In fact, it was exhausting. By the time I boarded the bus back to Busan, it felt like every muscle in my body was lashing out at me in attack. It was a struggle to find a way to sit comfortably for the 4.5-hour ride home. But when I thought about sitting on that mountain with my feet in my bindings, looking at the astounding view around me, I had no regrets. I knew I had made the right choice. I had tried something new; I had lived, and it was incredible! Life is full of adventure, for those who are open to the possibility. All we have to do is keep our eyes open, and take a chance when it arises. If you’re willing to try new things, then there are endless opportunities to do so. There are always new activities, foods, and drinks to try, new sights to see, new places, cities, and countries to visit, and new people to meet. Next time you have the option to play it safe or go on an adventure, why not live a little? All set to learn in my Canadian colours! Since then, I’ve been writing at least 500 words every single day. While every day has been significant in its own way, today, January 10, is the most special. Why? Because it’s day 31 of my 31-day challenge. That means: I DID IT! Day 31 is finally here – the finish line! The fact that I accomplished this may not seem like a lot on the grand scheme of things, but to me, it means so much – and here’s why. For the past few years, I’ve been playing with the idea of being a writer; mulling it over in my mind, entertaining it, but never knowing for sure if I could really do it. Sure, it sounded nice – being able to work at home if I wanted to, or from anywhere else in the world, for that matter. In recent years, my interest in and desire to travel has increased significantly, and I began to wonder if maybe there was a way to fit writing into some sort of travel lifestyle. The idea that if (or, more likely, when) my wanderlust got too strong, I could take my work on the road with me, became more and more appealing. A career in writing might just give me the freedom that I’ve always craved; to be able to pack up and go with relative ease, at any time. Go where? Who knows! Everywhere. The answer is everywhere. So, there I was, with all these ideas swimming around in my head; dreams for the future. That’s all they really were – dreams – because I didn’t have the confidence to see if I could make them come true. I didn’t have the guts to see if I could really write. I just thought about writing, and imagined how it would feel to be a successful writer someday. Maybe one day, I’d write a column for The New York Times. Maybe I’d be sent off to explore the globe on assignment for National Geographic Traveler. Or maybe, I’d build a successful travel blog with a massive audience. People all around the world would be following me religiously, awaiting my every move with baited breath. Where is she off to next? they’d wonder. What adventures will she get up to this time? Okay, I’ll admit it. Maybe that last one is a little extreme – but you get the idea! My dreams had no limits. I realized something when I stumbled upon Jeff Goins‘ blog, though. Miraculously, I discovered that the key to being a writer of any sort…was to start writing! If I never got any words down on a page, I could be absolutely certain that I’d never get the chance to write for any of those esteemed publications I’d been dreaming about. In fact, I’d never even be able to call myself a writer at all, regardless of whether I wrote for a living or just for pleasure, with no one ever seeing it. That’s what this writing challenge has done for me. It’s given me the motivation I needed to start doing the real work – to start writing. Each day, I wake up knowing that at some point during the day, I need to write. And knowing that I will. Now that I’ve gotten into this habit, it’s not so much a question of whether I’ll write today, but a question of what I’ll write about. During the past month, I’ve written about all kinds of things – some of which I’ve posted to my blog, and some I’ve written just for myself. I’ve written about my travels, my struggles, my thoughts, my questions, and my feelings. I’ve written about books I’ve read, holidays I’ve endured away from home, and people I’ve met. While not all of my writing this month has been earth-shattering, I’m still proud of it. I’m proud of what I’ve accomplished. I’m even proud of what I wrote on the days when I just didn’t feel like writing, because those days were the hardest, and yet I still managed to get something down. This journey hasn’t been easy, but it was one of the best decisions I’ve made in awhile, and it’s something I know I’ll be grateful I accomplished 10 years down the road. Now, it’s time for me to celebrate. The other day I read a quote that has stuck with me ever since. Here’s the result of what I took from it. During the journey of life, everyone goes through tough times. Everyone hurts. Everyone struggles. Everyone experiences some form of pain or loneliness. The reasons behind these feelings and their intensity differ, depending on the person and the situation. But these are all factors in the human experience. There are times in your life when you’ll feel like no one really cares about you. You’ll feel lonely, like no one understands you. During those times, it’s easy to internalize those feelings; to start thinking that you’re worthless, that it’s your fault no one cares about you, that you aren’t worthy of being loved. It’s easy to imagine these things about yourself, because in your mind, you have the proof: no one even notices when you’re struggling. But the truth is, the actions (or apparent inaction) of others has nothing to do with you. The reality is that other people’s lives don’t revolve around you, as much as we all like to think they do. Most people have so much going on in their own lives that their world revolves around themselves. They have so much packed into their heads that they can’t see beyond their own to-do lists. Their thoughts are continually focused on the future – that person they have to meet, the deadline looming over them, the bills they have to pay, or the thousand other trivial thoughts popping up to no end. For those of us trying to remove ourselves from that trap of non-stop thinking by learning to live in the moment, it can be hard to connect with these people on a deeper level. They are simply “too busy.” They have no available space in their minds for making personal connections, and certainly no time to spare. My experience in trying to connect with someone trapped in the “too busy” mindset has usually resulted in feeling either neglected or guilty; neglect because they don’t seem to show a genuine interest in my well-being, or guilt for loading more problems onto their already overflowing plate by sharing my struggles with them. However, I’ve learned some important things over the last few months through this experience. It’s a saying I’ve been familiar with for a long time, but am only just realizing the value of now. Just because someone appears to be too busy to care about you, it doesn’t mean they don’t. You can never truly know how someone else is feeling or what they’re thinking. People’s words and actions are not always representative of their true feelings. So, while someone seems indifferent to your suffering, or appears to not even have noticed that you are lonely or hurting, they may actually love you with all their heart. For me, that’s the hardest part to remember. It’s easy to make assumptions based on the actions of others, but these assumptions will likely lead you to nothing but pain, often because they aren’t correct. So, next time you feel invisible, remember that the friends and family you are expecting attention and validation from, also have their own lives. It doesn’t mean they don’t care about you. They, too, are struggling through this wild ride we call life. Maybe they haven’t yet broken free from the anxiety-inducing task list running through their head. Maybe they don’t know how. Maybe they haven’t even realized that it’s a possibility. Maybe they don’t believe it is. I guess in the end, we’re all just doing our best. I’m no expert on living in the moment, but I’m trying to live a life of peace. For me, that means living with a mind free of clutter. New Year’s Resolutions: useful or not? All over the world, people tend to make a big deal out of celebrating the start of another year. 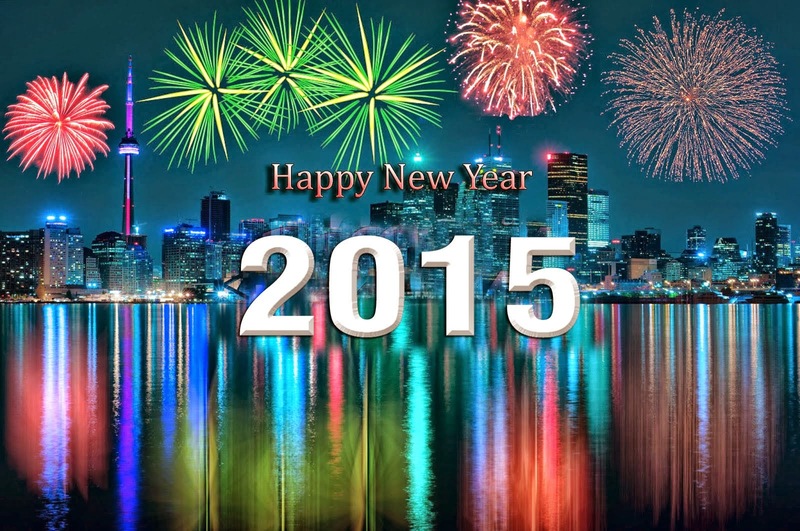 Many people see the new year as a re-birth in a way; a chance to start over, or start fresh. They see the beginning of another year as an opportunity to look at their lives, and to make goals and plans for the future. Many of us view the new year as a time to reflect as well, to look back on what the past year has brought us, and to learn from it; the mistakes we made, the lessons we learned, the things we accomplished, and the things we didn’t. All of these aspects are a part of any given year, but it’s up to us what we do with them. For many of us, the start of a brand new year brings hope. Hope for a better future. Whatever struggles we endured during the year before, whatever pain we experienced, a new year brings hope that we will overcome the struggles and that the pain will be healed. For others, New Year’s Eve or New Year’s Day is a special time to be spent with family and friends. What better way to start off a new year than to have your loved ones by your side? If we’re not careful, though, New Year’s Day can become little more than an excuse; a reason not to do things we need or want to do now, because we’re waiting for the new year. “It’s better to start fresh with the new year,” we tell ourselves. “Our goals or resolutions will mean more if they are officially set on New Year’s Day.” We start to see the new year as a saving grace, and wait for it to come, sometimes for months, so that we can get on with our “new” lives. But does this really make sense? Is it really effective to wait for New Year’s Day to set New Year’s Resolutions, when we could just start working towards them now, regardless of what the date is? New Year’s Day, after all, is just another day, the same as any other. The only real difference is that it happens to be given a special name. So, while we wait for this “special” day, (for who knows how long), aren’t we really just giving up valuable time that we could be using to make progress on those resolutions? I understand the value of setting goals and having something to work towards achieving. I also understand that people like tradition, and for many, setting New Year’s Resolutions each year is tradition. But what I don’t understand is the waiting part. What are we waiting for? As much as we like to pretend we do, the truth is we don’t have unlimited time on this Earth. I’m realizing more and more lately that life is all about living in the moment. It’s here now, but it may be gone tomorrow. I can’t agree more. So, while you’re busy setting goals and making those plans for 2015, don’t forget to remember that in reality, all you have is this moment. The only thing you can really count on is the moment you’re in right now. So enjoy it! No one knows what tomorrow will bring, so make the most of right now. Whether you spent New Year’s Day resting, hanging out with loved ones, making plans for the new year, setting goals to achieve this year, or reflecting on 2014, I hope you enjoyed yourself. That’s the key. Happy New Year from Busan, everyone! I’m now only about a month and a half into my 25th year of life on this incredible planet, but already, a lot has happened in that time. Even before my birthday, in the months leading up to this milestone in my life, some important events were taking place. I should note, though, that most of these “important events” happened in my apartment in Korea, with myself as the only guest. Seems far from Earth-shattering, doesn’t it? However, this series of little steps really did shatter my understanding of the world at that time. So, what exactly did I do, you ask? First, I read some books that literally changed my life and helped me climb out of the unhappy hole I’d been stuck in for the last several months (more to come on this in another post). After I’d cleared my head of most of the junk swimming around up there, I found I had freed up a lot more time that I could use to focus on myself. I thought more seriously about what I might actually want to do with my life. The two things I came up with (besides sleeping way too much, of course!) were travel and writing. Deep down, I knew both of these passions had already existed in me for quite some time – I just hadn’t really believed I could do something with them. I began reading blogs and articles I found online about these two passions, and the more I read, the more interested I became in actually doing something about them. That’s when I first discovered Jeff Goins‘ blog, and my mind seemed to switch gears; from then on it was full speed ahead! I started thinking about my own blog again – that poor, lonely one I had abandoned over a year ago and had never touched since I’d been back in Korea. Maybe it was time to give it a go again! I also joined social media networks that I had been avoiding for as long as possible, thinking (more like pretending) they weren’t really all that important anyway. A writer just writes, right? Each time I visited the page of an online travel magazine where freelancers can submit their work, I was faced with the glaringly empty boxes of all the social media networks I was not part of. The list went on and on: Instagram, Twitter, Google+, LinkedIn… And worst of all, these boxes were mandatory! I had my work cut out for me. Joining and figuring out how to work all these new platforms was going to take some time. The next thing I did was probably the biggest step yet, and that was joining the My 500 Words writing challenge. Now one week into this challenge, I can already see how it’s beginning to transform my views on being a writer. I still have three weeks to go, and I’m excited to see what I’ll be able to accomplish by the time I reach the finish line. 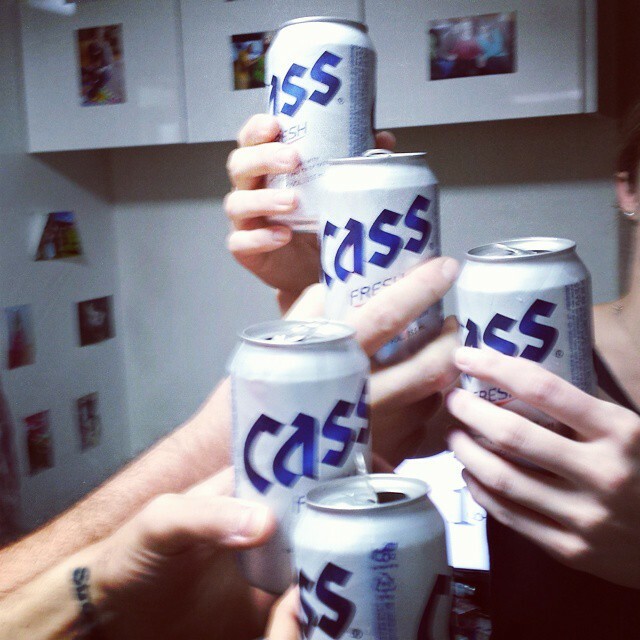 It’s amazing what happens when you start your year off right – taking the plunge into quarter-century life surrounded by family, in your cozy little Korean apartment, with a can of Cass beer in hand! Day five of my writing adventure has begun. Still not as early in the day as I would have liked, but I’ll continue to work on that. Getting up early has always been a struggle for me. I’m one of those people who likes sleeping a little too much – definitely way more than is normal, and probably more than is even healthy! Most people who know me well know that if given the chance, I could easily and happily sleep most of the day away, every single day (especially during the winter!) Sometimes, I like to joke that I’m a professional sleeper. That’s how bad it really is! However, this passion for sleep that I’ve been blessed (cursed?) with tends to interfere with my other interests at times, particularly those of travel and writing. I’m sure you can see how my wanderlust might bump heads with my lust to hibernate from time to time! As much as I enjoy sleep, I can usually be coaxed out from beneath my warm, cozy blankets by the promise of an adventure (or coffee, of course). The promise of my computer screen waiting for me to finish writing my 500 words for the day has not yet become quite as enticing – but here’s to hoping it will by the end of this challenge! My first four days of this commitment have already been eye-opening for me. Each day, I’ve produced something that I’m happy with; maybe even proud of! Each day, I sat down, I started writing, and I didn’t get up until I had written at least 500 words on the screen in front of me. Some days, I sat down with an idea or topic in mind. Other days, I just started writing, and amazingly, a topic seemed to come to me as the words started to fill up the page. Sometimes, 300 words in, I discovered I actually did have something in mind to write about that day, I just wasn’t aware of it at the time I began typing! I’m realizing more and more that it doesn’t matter so much what I write about, as long as I write. It’s amazing how easy it is to develop a new habit. All you really have to do is decide to do it. Make a commitment, and then stick to it, no matter what. I’m only five days into this month-long commitment, but I’m pretty confident that I’ll have no trouble completing it successfully because of one simple reason; I finally made the decision to start. In reality, all I really needed to do was start. Now that I’ve tackled that monster, I want to work towards creating another habit: getting up early! For a professional sleeper, I think this habit will prove to be a little more difficult to develop. Any ideas?